Are You Sowing Seeds of Health? While this scripture is referring to the spiritual aspect of sowing seed, I find it relates very clearly to our physical health as well. 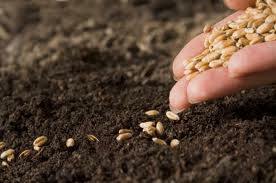 Seeds are dormant until they are planted and given the proper environment in which to grow and flourish. You can keep an envelope of seeds for years and they'll never change into anything else. Once you take those seeds and plant them into nutrient rich soil, water them regularly and let them get daily sunlight, the potential that was always resident within that seed is released and enabled to grow and flourish. It works in much the same way in our bodies. Everyone has cancer cells in their bodies. They are dormant. As long as you provide a health-producing environment by feeding your body with nutrient-dense, whole foods, drinking clean water, getting fresh air, sleep and exercise, managing stress, then those cells remain dormant. You don’t sow tomato seeds and grow cucumbers. You don’t plant a peach pit and have a watermelon vine spring up! Whatever you sow is what you reap and that includes what you sow into your body. Every day you have the opportunity to create an environment of health within yourself. When you do, the seeds you consciously sow - sleep, real food, water – are creating health and strength. However, if you neglect your inner ecology and let it get overrun with garbage in the form of junk food, sodas and drugs, then those dormant disease seeds are sparked into life. It won't take much for them to take hold. Now, it may not happen quickly. In fact, it almost never does. Researchers tell us it takes many, many years for a cancer to grow to the point when it is diagnosed. The diagnosis may come about quickly - but the disease was years in the making. Don't think just because you look good and feel pretty well, that you can just continue smoking or eating fast food every day or never exercising and you will stay healthy. Just as a dormant volcano can erupt at any time, those dormant disease seeds can be activated if you provide the proper environment. A few sodas a day or several fast food meals a week don’t seem all that dangerous – they don’t look like poison. But, we are told in 1 Corinthians 15:37, 38 that “..what you put in the ground is not the plant that will grow, but only a bare seed.. Then God gives it the new body he wants it to have. A different plant grows from each kind of seed.” In other words – it may not look so bad, certainly not dangerous, but you may not see what it can become! I want to encourage you today to begin cleaning up your inner environment to prevent those bad seeds from taking root! It is so much easier to prevent disease than it is to cure it. So I ask you – what seeds are you consistently sowing in your body – seeds of health or seeds of something else? What is one change you can make today to improve the quality of what you are sowing?